While you may be a law-abiding citizen, that doesn’t mean that everyone in your life is as well. So what are you supposed to do when your loved one is locked up? As someone who has never had any issues with the law, you probably would be at a loss if someone you care about called you and asked you to bail them out of jail. If you find yourself in this predicament, you will probably have a good number of questions you will need answered regarding the entire bail process. Continue reading below to learn the answers to your most pertinent questions regarding bail bonds. What is the Process of Bailing Someone Out of Jail? The first step of the process when someone is arrested is the booking. Once your loved one is booked as an inmate in the jail, the bail will then be set. When this happens, you can contact the jail and find out what amount the person’s bail has been set as. Then it will be time for you to find a professional bail bond agent. This will then begin the bail bond process. The entire reason bail bond agents exist is so that the bail can be solicited and negotiated on behalf of the surety insurer. You will come across this term a lot as you complete your research about bail bonds. A surety bond is simply just another term that is used for bail bond. This allows the inmate to be released from jail even when they don’t have the full amount available to pay. However, someone must post the bail on behalf of the inmate as they are the only one who can contact the bail bondsman. Is There Anything I Should Know Before I Contract a Bondsman? When you sign the contract of a surety bond, the inmate has to completely give up his right to extradition is he or she decides to leave the jurisdiction. This means that once the inmate is out of jail, they cannot leave the city/state boundaries, or they can be hauled back to jail. The normal fee for posting bond is 10 percent of whatever the bond amount is. This means if the bond amount is set at $1,000, you will have to pay $100. In the case that your loved one has to go to federal court, this amount may increase to 15 percent. This amount has to be paid before the inmate will be released from jail. There are several ways you can choose from when you are posting bail. The first is to use a bail bondsman. This is the method we would suggest you use. The second option is to pay the entire amount of the bail out of your own pocket. Lastly, some people will opt to use their home or other real property to act as collateral for bail. The fee you will pay the bondsman (10-15% of the bail) is non-recoverable. This portion is what released the defendant from custody. Additionally, if your loved one gets arrested again, you will not get a refund. However, if the bondsman doesn’t hold up their end of the contract, you will then possibly be able to receive a refund. 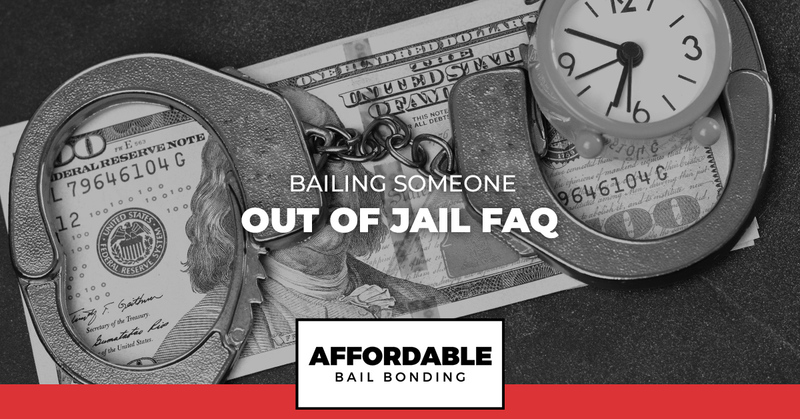 If you live in the Roanoke area and you need more information about bailing someone out of jail, do not hesitate to contact us at Affordable Bail Bonding today. We have the answers to all of your questions so that you can get the ball rolling and get your friend or family member out of jail in no time at all.